Your existing backers may have other friends who would be interested in supporting your project. Potential backers who received your initial campaign launch communication may have forgotten or may not realize the number of days left in your campaign. Share your project with people they know. Increase their pledge and reward. Preorder additional copies of your final product. To promote your deadline to potential backers, you can use all the same tools you used for announcing your campaign. Your goal is to encourage backers to come on board before your campaign ends. The campaign owner for the game Spaghetti & Meatballs has used his personal Facebook page to let people know his campaign has 17 days left. Note how he also outlines the level of support he needs in order to meet his goal. 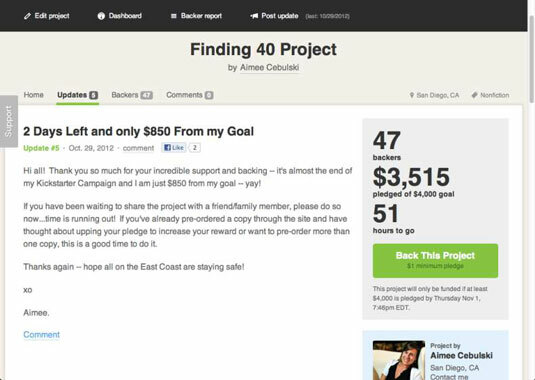 What’s great about this post is it shows how very attainable the goal is if many people participate on a small level, highlighting the power of crowdfunding. 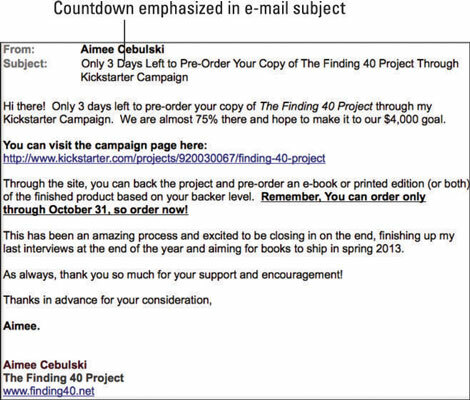 You may also have used personal e-mails to introduce your Kickstarter project to family, friends, co-workers, and other contacts. When you have three weeks, two weeks, and one week left, it’s a good idea to send a reminder e-mail with the countdown highly emphasized in both the subject line of the message — and visible high up in the content. Each day, you can log in to your Kickstarter project and see the number of days left to go, your total backers, and the percentage of your total goal received. Kickstarter is all or nothing! If you find yourself with a week to go and a large percentage left to raise, think about contacting new organizations or groups for potential backers and alerting them to your impending deadline.